Global Laser Processing Market is expected to reach USD 9.70 Billion by 2024 from USD 6.40 Billion in 2016 at CAGR of 6.10% (Detailed analysis of the market CAGR is provided in the report). Global Laser Processing Market is the advance technology of optical electronic device which contain narrow beam light with more energetic photons used in various industries process by hitting the object and results into welding, cutting, surface engineering, marking, repairing and direct parts fabrication. Global Laser Processing Markets segmented by Types, Application, Vertical, and geography. Types segment is sub segmented as Liquid laser, Gas laser, Solid laser and many other lasers. This solutions Types segment is estimated to grow the Laser Processing market share in different scope of sector in the forecast period. Application segment is bifurcated as Welding, Drilling, and Marking & engraving, Cutting, Micro processing, Advanced P\processing in Laser processing market. This application is advance use in industries by the various by of types segment which make the work easier and efficient to boost the market. And vertical is sub segmented into Automotive, Aerospace & defense, Architecture, Microelectronics, Medical & life sciences, Machine tools and Others. Architecture segment is estimated to have the largest in laser processing market. Because increasing in demand for designing study and restructuring. Aerospace and defense is also the second largest sub segment to boost up the laser processing market growth. This laser processing market is most used in medical sector. Thus this growth is attributed to increased efficiency. The Laser Processing market on the basis of geography is segmented by North America, Europe, Asia-Pacific, Middle East & Africa and Latin America. 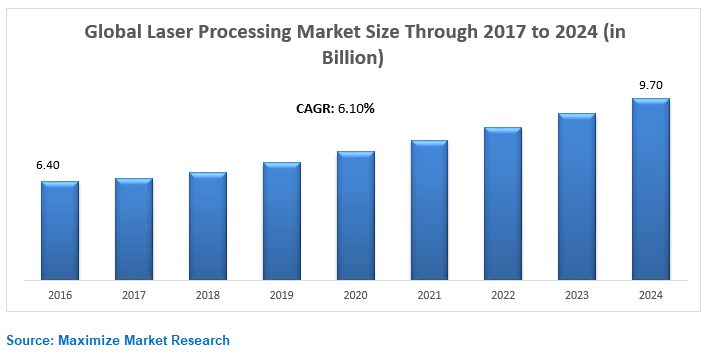 • Universal Laser Systems Inc.
Research report categorizes the Global Laser Processing Market based on Types, Application, Vertical, and geography (region wise). Market size by value is estimated and forecasted with the Application of leading companies operating in the Global Laser Processing Market with key developments in companies and market trends. Maximize Market Research offers customization of report and scope of the report as per the specific requirement of our client. 9.3.4 Universal Laser Systems Inc.